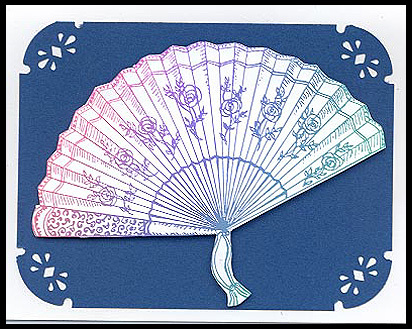 “Rose Fan, Lg.” is stamped in a rainbow pad, cut out and mounted with foam on card stock which has been corner punched and layered on white card stock. Card by Margaret Wiggin. Tags: Corner Punch, Foam tape, Margaret Wiggin, Rose Fan Lg.